Working an attorney in the 1980s for noted human rights lawyer Yunus Mohamed, Pillay represented several anti-apartheid activists, including hunger striker Sandile Thusi. The firm also instructed the defence of United Democratic Front members including Frank Chikane and Terror Lekota during the Delmas Treason Trial. Pillay continues to have a keen eye for the rights of the marginalised. When Standard Bank went after Mbuyiseni Dlamini, demanding he continue to pay money for a motor vehicle he returned after four days because of serious defects, Pillay was sensitive to the right to equality before the law enshrined in the Constitution and the protections offered by the National Credit Act. The bank had argued that Dlamini had not followed procedure in attempting to end the credit agreement. Pillay, noting that Dlamini, who had only completed Standard One (Grade Three) and was “functionally illiterate”, had not acted with deliberate mendacity, declared the rescission of the credit agreement to be valid. She also ordered the Standard Bank to pay the costs of the action. Last year, Pillay declared sections 35 and 39 of the city’s Informal Trading Bylaw to be unconstitutional and invalid following raids by the eThekwini Municipality’s police on street traders. The metro police in Durban also impounded goods and sold off whatever was perishable if traders were unable to pay an impoundment fee. Sitting in the High Court in Durban, Pillay was mindful that these bylaws, which required traders with permits to be at their stalls for between three to five days a week, limited their access to the courts, and that the deprivation of their stock “impacts on their identity and dignity as people with property”. Pillay completed her B.Proc at Unisa in 1982 and an LLM from the University of KwaZulu-Natal in 1993. 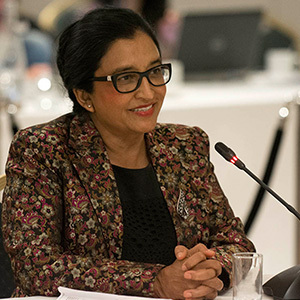 An expert in labour matters, and one of the drafters of the Labour Relations Act, Pillay was appointed to the Labour Court in 2000 and the KwaZulu-Natal High Court in 2010. She was shortlisted for the vacant position at the Constitutional Court last year and has been a visiting academic at New York University and Oxford University. It was evident during Pillay’s interview that she doesn’t suffer fools lightly: A straight talker who is blunt, not so much as a knife that may need sharpening, but in a sledge-hammer kind of way. Which may have worked against her during an interview where she locked horns with Economic Freedom Fighters leader Julius Malema over his apparent misunderstanding of the meaning in her use of the word “political” and essentially told Supreme Court of Appeal President (SCA) Lex Mpati that if he didn’t want her on the Bench, he could shove the job, quite frankly. When Mpati pointed out that Pillay had never acted at the SCA, Pillay quickly responded that she had first been approached in 2013, when she was about start a sabbatical at Seattle University in the United States. On her return, she had “dropped” Mpati an email saying she was “back in the saddle” which had been noted – but she never heard from him again. Pillay reiterated her earlier point about everything in life being political. Malema pursued it, asking whether the “political correctness” or the “legal correctness” in a judgment was important. “It has to be legally correct, but if the politics affects the legality it must be considered,” said Pillay. Pillay went on: “I don’t think you understand me, Mr Malema… I am not talking about party politics… No, you are not listening to me, even the law is political… even the system used to set up the law is political,” she said in an argument which, one got the distinct sense, Malema had used to test Pillay’s patience and temperament. Pillay was also asked questions about judicial accountability and the obstacles to access to justice amongst others. She later clarified that while she had a long career as a antiapartheid activist, her “politics” had not affected her acting without fear or favour as a judge. Pillay had started her legal career as an attorney in the 1980s for noted human rights lawyer Yunus Mohamed, Pillay represented several anti-apartheid activists, including hunger striker Sandile Thusi. The firm also instructed the defence of United Democratic Front members including Frank Chikane and Terror Lekota during the Delmas Treason Trial. An expert in labour matters, and one of the drafters of the Labour Relations Act, Pillay was appointed to the Labour Court in 2000 and the KwaZulu-Natal High Court in 2010. She was shortlisted for the vacant position at the Constitutional Court last year and has been a visiting academic ay New York University and Oxford University.